With a grin spreading across his face, a man bends down to take a photo of a miniature rubbish bin and street sign at the foot of a building in the southern Swedish town of Malmo. Lost items from a dollhouse? 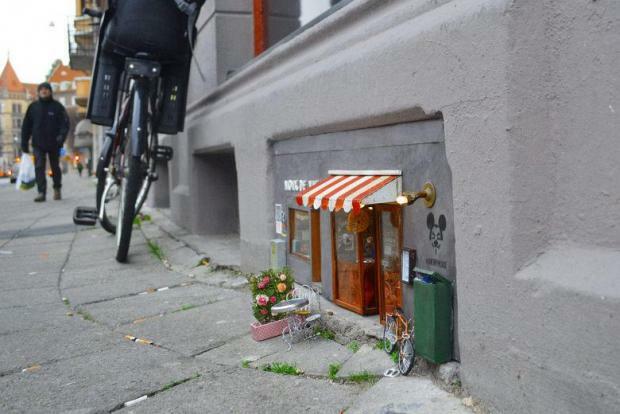 No, the Lilliputian objects are the latest installation from the artist's collective Anonymouse, known for its urban architecture for mice with intricate decor worthy of an animated film like "Ratatouille". "One morning, there was a crowd of people outside the building and we couldn't understand why," says 74-year-old resident Irene Bengtsson. "We came down to the street and we saw this little installation," she told AFP, visibly tickled by the creative initiative. Built into the building's air vent at pavement level are two little pastel-coloured storefronts that would fit into a shoebox. There's a dance school for mice on the top floor, over a barbershop and a shelter for "lost and travelling" mice. The collective presented their first artwork - a restaurant and nut shop - in December 2016. "We were a group of friends sitting and talking about our shared love of tales where animals live in a world parallel to ours, where they take care of things we lose," an Anonymouse member who presented themselves as Yasha Mousekewitz told AFP in an email. They wanted to try to reproduce a microcosm of that world. "We thought it would spread joy among passersby. But it took on even bigger proportions, so we decided to continue," Mousekewitz said. "I like to see unexpected things in the city, well thought-out, funny things. I like it," said passerby Jenny Berg. 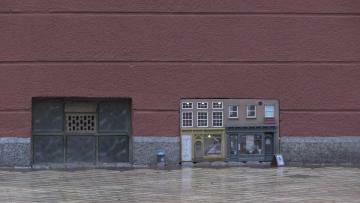 Even under a glacial rain, pedestrians stop to admire the details inside the "Paw to Paw" shelter, the chair at the "Hair and Furever" barbershop, and Mama Mousekewitz dance studio. Anonymouse have set up more than 10 installations so far, including an amusement park, travel agency and antiques shop, with three to seven artists involved depending on the project. The group has also done other installations in other cities in Sweden, as well as in Bayonne in southwestern France and the Isle of Man. The installations use materials the artists find or have collected. "Then we try to think, 'What would a mouse be able to use this for? '," Mousekewitz said. The artworks are occasionally vandalised, and if that happens, "then we take them down." The Malmo project was unveiled in mid-December.